Ok, you know that you ‘should’ be more secure but how do you go about it? What do you do? Below we outline several key areas that will help you protect yourself and increase personal security. An older computer opens up your chances for spyware, malware, virus infections, hacking and identity theft. The most important thing you can do, is to always make sure your Windows operating system is up to date. Perform Windows Security updates on a regular basis (at least once a month). We are not a fan of Automatic Windows Updates as it can sometimes wreak havoc on a computer. When performing Windows Updates the Critical Updates are the most important and what keeps you secure. Other updates are considered ‘optional’ updates which are usually non critical such as drivers etc. Note when your automatic update setting is turned ON, you will get all critical updates plus ALL optional updates. This is the part that we do not like. Particularly on our multi display computer systems, it usually tries to change the video drivers and ends up dropping displays. For more on keeping your computer tuned up, see Routine Computer Maintenance. Backup, Backup, Backup! We can’t stress this enough. We have said this for more than 2 decades now. “The frequency of your backups should be directly proportionate to the value of your data”. If it is priceless, back up daily. A general rule of thumb is to back up no less than once a week for general data, word processing documents, pictures etc. We recommend backing up accounting data daily. Quicken and QuickBooks both have a backup utility built right in, so no excuses! If you don’t know how to backup, learn. We have talked before about how to create strong passwords, but have you been using them? If your passwords are weak, take the time to fix that now (particularly with online banking). Create strong passwords, login when you need to and log back out when you are done. Make note of your own behavior. Do you log in to your banking, Google, Amazon, etc and walk away from your computer? This is a bad practice and you are leaving yourself vulnerable. Get in the habit of logging out of everything, every time, when you are done. ​You would not believe how much of your personal information is captured simply by browsing the internet. Most people do not give it a second thought. They are looking for something, they want a fast answer, they “Google it”…done. It is easy, it is fast, the answer is there. Keep this in mind. For example, let’s say you are looking for bread recipes for your bread machine. You Google it, found a great one and you are baking away. Thanks to browser cookies, Google now knows that you have an interest in bread, bread machines, recipes and so on. Ok your bread is done, the house smells great! You come back to your computer and you are getting spam emails about Martha Stewart’s new cookbook, offers from Recipes.com, cookbook specials, sales on bread machines etc. That is no coincidence. There is an easy solution for that, go incognito ! ​In Chrome choose New Incognito Window from the dot, dot, dot menu on the upper right. You can also RIGHT click on the Chrome icon at the bottom of your screen, or hit CTL+SHIFT+N. In Internet Explorer, from the TOOLS menubar (right click on top of browser if not showing) use InPrivate Browsing. In Firefox on the upper right menu choose New Private Window, or hit CTL+SHIFT+P. It is not a cure-all but very easy to do on the fly without slowing you down. Storing your data in the cloud certainly makes things easier and convenient. But be aware that when you sign up for services like DropBox, iCloud, Evernote etc you are likely agreeing to share your data on some level. Do your research and actually read their Privacy Policies. Also ask them how your data is encrypted another security point. If you do not feel comfortable with what you find, consider storing your data locally. Regardless of which email program you use, empty Junk/Spam and Deleted Items regularly unless you love getting spam. This is the reason why. Spammers are true con artists. They know you delete them on contact, and end up in your Spam Folder or Deleted Items folder. Fine with them, they can work from there, and you have forgotten about it forever thinking they are gone. NO. Think of this like a Trojan Horse. You should delete your Junk / Spam folder and Deleted items several times a DAY. Take a look now. How many items do you have in these folders now? Try to keep them empty at all times. ​Nortons, McAfee, Avast, Kaspersky, AVG you have probably paid for at least one of these subscription services. Good news! Microsoft Internet Security is FREE, updates automatically and runs in the background. It does not interfere with other software programs and does a pretty good job at protecting against viruses, malware and spyware. It just makes sense that since most of the attacks are against Microsoft software, who better to provide the protection against it? Click on it. Did you know that when you sign up for Pandora the default setting is that you agree to OPT IN to be emailed from 100’s of companies? Also, click on the PRIVACY link at the bottom there. It Pandora states this: ”We may receive or collect information about you from third parties, and combine and store it on our servers with other information we may have already received or collected from you“. 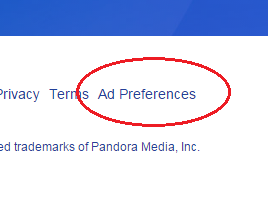 ​Unfortunately, there is no way to OPT OUT permanently with Pandora so you have to do this every day. It takes just a few seconds, click on Select All and Submit Opt-outs. Get in the habit of doing this. Your spam folder will thank you for it. When you are logged into your Google account, you are logging into ALL Google products and your data is being stored. By that I mean the sites you visit, things you search for on the web etc. in the form of browser cookies and other means. From Google’s perspective this is all in an effort to create a more personalized search experience for the user by recording what the user likes and dislikes. The tradeoff is that they are capturing personal information about you whether you like it or not. To avoid this, login to your Google account to check your email, calendar or use other Google apps but when you are done, by all means logout. Also don’t forget about “Incognito Mode” mentioned above. If you are not protecting your family and your business with video surveillance in this day and age, you should be. With home invasions, terrorism on US soil and crime increasingly on the rise, it is a smart investment. Don’t buy cheap Costco cameras kits. Spend a little more and get a high quality camera system. Not only will the video be cleaner and sharper, you will be able to view your cameras LIVE from your phone or computer when you are away. Of all the advice that we have shared over the years, perhaps the most important is this: Invest in quality, not unreliable, cheap, disposable technology and you will never go wrong. Creating a productive, secure and profitable work environment starts with high quality products designed with high quality components. We take great pride in using only the ” latest and the greatest” components in all of our multi monitor computer systems and video surveillance systems. When seconds and minutes count, you have to be able to depend on your technology to stay afloat and competitive in today’s rapidly changing world. In other words: “If you are not riding the wave of change, you will find yourself beneath it”.